Instead of composing a post myself on Hrant Dink, who I mentioned in my homily, as I had been pondering, but dreading for many reasons, I am glad to direct anybody interested to Mustafa Akyol's post on First Things's Observations & Contentions blog entitled The Hrant Dink Murder and Its Meaning. Once again, the Bush Administration appears guilty of refusing to acknowledge scientific fact by interfering with and micromanaging the government's climate programs as well as controlling what government employed and funded scientists have been allowed to tell the public. The AP reports on Congressional hearings that show that "Federal scientists have been pressured by the White House to play down global warming". 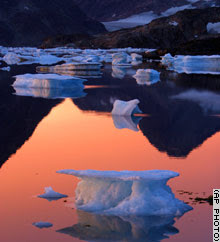 This should cause each of us to shutter, especially from an Administration that adamantly opposes mandatory measures to reduce to green house emissions and that, despite the willingness of signatory nations to substantially renegotiate the provisions of the treaty that caused concern to U.S., also refuses to have anything to do with the Kyoto Protocol. According to a leaked draft of a report by the Intergovernmental Panel on Climate Change as summarized by Lisa Merlini of Catholic Media Report: "Rising temperatures will leave millions more people hungry by 2080 and cause critical water shortages in China and Australia, as well as parts of Europe and the United States. . . By the end of the century . . . climate change will bring water scarcity to between 1.1 and 3.2 billion people as temperatures rise by 2 to 3 Celsius (3.6 to 4.8 Fahrenheit)." Quoting number 38 of Pope John Paul II's 1991 encylical Centesimus Annus in his Message for the 2007 World Day of Peace, Pope Benedict XVI writes: "Not only has God given the earth to man, who must use it with respect for the original good purpose for which it was given to him, but man too is God's gift to man. He must therefore respect the natural and moral structure with which he has been endowed". Building on these words of his predecessor, with whom he collaborated closely, the Holy Father goes on to write: "Alongside the ecology of nature, there exists what can be called a 'human' ecology, which in turn demands a 'social' ecology. All this means that humanity, if it truly desires peace, must be increasingly conscious of the links between natural ecology, or respect for nature, and human ecology. Experience shows that disregard for the environment always harms human coexistence, and vice versa. It becomes more and more evident that there is an inseparable link between peace with creation and peace among men. Both of these presuppose peace with God. The poem-prayer of Saint Francis, known as 'the Canticle of Brother Sun', is a wonderful and ever timely example of this multifaceted ecology of peace." (Message of His Holiness Pope Benedict for the Celebration of the World Day of Peace, #8). There are more encouraging signs of the Church's engagement on this issue that affects us all, as Rocco reports over on Whispers. Here are two thought-provoking takes on my really long post yesterday. One is from John Allen, who takes a more analytical approach to the issue of legal recognition of homosexual civil unions as it pertains to both Europe and the U.S., especially places with large Catholic populations. His point of departure, as was mine yesterday, is the adoption ruckus in the U.K., on which he comments. Secondly, is an interview given by the Archbishop of Canterbury, Dr. Rowan Williams, to the BBC as to why he and the Anglican Archbishop of York came out publicly in favor of the British government granting the Roman Catholic Church in the U.K. an exemption to the "Equality Act," which passed Parliament in 2006. The Act bans discrimination against gays, including in adoption rights. Upon the law's passage, Archbishop of Westminster, Cardinal Cormac Murphy-O’Connor, wrote to the Blair government requesting that Catholic agencies be exempted. After a weekend of Cabinet-level negotiations, PM Blair announced Monday that the church would not be exempt, but could have 21 months to make the transition. Dr. Williams hits the nail on-the-head when he says: "I think what’s at stake ultimately is whether the church is answerable finally to the State as the only court of appeal or whether the church can rightly appeal to other sources for its moral compass and whatever one’s views on this particular issue." Well and concisely stated. One of the most difficult issues facing Western, democratic countries is the Church/State relationship. As with most critical issues in our day, in our emotivist (to borrow Alasdair MacIntyre's term from his remarkable book After Virtue) society, this issue is mostly dealt with at the polar extremes and takes the form of shouting across the divide. However, one cannot fail to note the contradiction inherent in the desire of those who want to prevent people of faith from bringing their faith into the public square, to interfere, by means of civil law, in the life of the Church. In the U.S., if one sticks with a reasonably constructivist view of the Constitution, the religion clause of the First Amendment was written more with an eye to preventing government from interfering with the Church, than vice-versa. As a result, recent years have seen the erosion of religious liberty in our country and in the countries of Europe, especially under the ever-expanding auspices of the, frankly, frightening European Union. Now, do not misunderstand, I think a union of European countries is a great idea. I also recognize the legitimate autonomy of both the Church and the State and even the necessity for this arrangement. As with so many things, my hesitations are not about ends, but means. Therefore, the relevant question is not if, but how and to what extent union is achieved, just as the question is not should the Church and State be separate, they should for the good of both. But, this separation has to be respected from both sides and not result in people of faith being disenfranchised. Separation must not result in the State taking a de facto atheistic or agnostic stance because that, too, means choosing a perspective and, in the United States, it is a perspective at odds with the overwhelming majority of citizens who comprise our nation. Hence, faith in God is a constitutive element of the governed from whose consent the three branches of government (the judiciary not being exempt) derive legitimacy. On the part of religious believers, we must understand and respect that it was for good reason the founding fathers of the U.S. constitutionally banned an established religion and that, while we are overwhelmingly a nation of believers, we are also a constitutionally pluralistic society. This is what we might call a dialectical tension at the root of our republican democracy, thus requiring constant discussion, even negotiation. It is also important to note that much of what concerns Catholics in the arena of public policy is not merely derived from scripture or revelation, but from nature and reality. In a word, from reason. This is certainly the case with the Church's stand on life issues, such as abortion, euthanasia, the harvesting of embryonic stem cells from aborted fetuses, or creating life in the laboratory for the purpose of harvesting stem cells, in vitro fertilization, the death penalty, war etc. On issues more to the point of this post, reason and nature are also the bases on which the Church upholds the constitution of the family and on which our understanding of human sexuality is also based. Therefore, public, even political, advocacy for these issues does not boil down trying to impose our faith on anyone, as Senator Kerry mistakenly said over-and-over in 2004. As Catholic Christians living in the U.S.A., we must recognize that democracy, as noted in an earlier post, Faith and Politics in a Pluralistic Democracy, to quote Senator Barak Obama, "demands that the religiously motivated translate their concerns into universal, rather than religion-specific, values. It requires that their proposals be subject to argument and amenable to reason. I may be opposed to abortion for religious reasons, but if I seek to pass a law banning the practice, I cannot simply point to the teachings of my church or evoke God's will. I have to explain why abortion violates some principle that is accessible to people of all faiths, including those with no faith at all". At the intersection of faith of reason is the dignity of the human person, which is the foundation of all these stands. One's stand on any of these issues essentially boils down your view of the human person, be you Catholic, Protestant, Orthodox, Jewish, Muslim, Hindu, Buddhist, Jain, Sikh, atheistic materialist, or agnostic, or whatever. The Christian Tradition, which is a living tradition, certainly supplies us with the intellectual resources to coherently and persuasively engage in the kind political dialogue a healthy pluralistic democracy requires. Returning to Europe, two very significant things have occurred in recent years that are instructive. The first is the rejection of the proposed E.U. Constitution back in 2005 when the proposed Constitution was rejected by both the people of France and the Netherlands. Despite its rejection, among those who are seeking re-calibrate the E.U. constitution in order to bring it back for another ratification vote, as with its original drafting committee, there is refusal to acknowledge what is but historical fact, Europe's Christian heritage. The second event occurred even prior to that when, in 2004, the E.U. rejected Rocco Buttiglione, as the E.U. 's Justice, Freedom and Security minister primarily because he is a believing, professing, practicing Roman Catholic and during his hearings, when asked, he affirmed his belief that abortion, artificial insemination and homosexuality are immoral, even sinful. 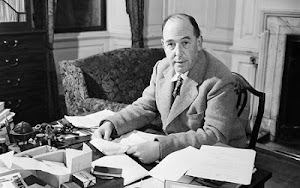 On the subject of homosexuality, when questioned, he responded, ""I may think that homosexuality is a sin, and this has no effect on politics, unless I say that homosexuality is a crime". Once his nomination became imperiled, he wrote to EU President, José Manuel Barroso, "The only thing I cannot do is to change my principles against my conscience for political convenience". The Church in the United States in recent years has not been immune to the erosion of what, according to our Constitution, should be exempt from government interference. That being written, I have to admit, that when Church institutions take government money, things get a bit complicated, but receiving such funds to work for the common good should not require the Church to forsake its beliefs. The most recent example of this occurred in Massachusetts last year, when the state sought impose a law on Church-run adoption agencies, forcing these agencies to allow gay couples to adopt children. Refusal would result in Church-run agencies losing their ability to provide adoption services. As a result, and no doubt with great sadness, Cardinal O'Malley directed the Catholic agency in the Archdiocese of Boston to cease providing adoption services. This brings up quite a few questions, not about what motivated the refusal to grant exemptions to faith-based agencies, but about what are best described as unintended consequences and effects of such an absolutism, which, again ironically, is the fear expressed by secularists when seeking to ban faith from the public square. In order to see what happens when this kind of absolute thinking prevails, regardless of who originates it, a few questions need to be asked. The first among which is, Who, if anybody, wins in such a case? Orphaned children? No. The Church? No. The state? No. Gay couples, who, in the state of Massachusetts, were already able to adopt children from just about any other licensed adoption agency in the state? No. Liberty and justice? No. Anyway, this same story is playing out in the U.K., only on a national level. William Rees-Mogg, in the Times online, addresses this issue in a piece entitled Now, all our English liberties are becoming orphans. Let us not lose the focus of our faith and forget that in many instances such challenges provide us, as Christians, a tremendous opportunity to witness to our faith by not being absolutists and by proposing constructive solutions that build bridges and by not self-righteously burning them. One example of this occurred back in 1997 when then-Archbishop Levada responded in a model way to such a challenge from the San Francisco Board of Supervisors, which he wrote about in an article for First Things, The San Francisco Solution. This lesson has been well-learned by the Holy Father and put at the service of his determination to engage the world in a positive manner. This is borne out by his appointment of Levada as Prefect for the Congregation for the Doctrine of the Faith and his elevation of the former S.F. 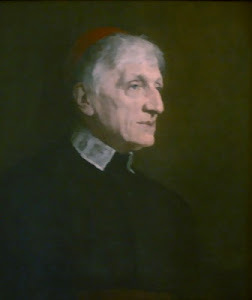 prelate to the College of Cardinals and by his wise appointment of bishops in the U.S., especially to prominent major archdioceses, like George Niederauer to S.F. and Donald Wuerl to D.C. This strategy is currently being employed, as Rocco, just the other day highlighted over on Whispers , in the Archdiocese of Seattle, in a post entitled In the Northwest, Echoes of Levada. In my opinion, this approach is preferable to the ineffective, heavy-handed public pronouncements by some prelates during the last presidential election in the U.S. I would add that, unfortunately, Cardinal Levada's S.F. Solution was not replicated by in the recent controversy surrounding adoption services in San Francisco, which came to the media's attention in the wake of the Massachusetts controversy. In sending the twelve into the world for the first time, Jesus told them he was sending them "out like sheep into the midst of wolves". So, he ordered them to "be wise as serpents and innocent as doves" (Matt 10,16). This is our challenge. "All churches and church leaders," said Thomas Collins, the newly installed Archbishop of Toronto, in a pre-installation interview with the Toronto Star, "have not only a right but also a reponsibility to be active in such political and policy discussions. "We are part of society," he said. "We've been here since the beginning and are massively involved." By request, here is my homily from this past Sunday. For a limited time, you can watch the Intermountain Catholic re-broadcast of the entire Mass without registering, but if you are an IC subscriber (why wouldn't any Utah Catholic be? ), register on the site and, among other perks, you will have unlimited access to archives of Masses from our lovely Madeleine. Today’s first reading, taken from the book of Jeremiah, lays the groundwork for what God is saying to us today. In this passage, God tells Jeremiah that even before he was born, God dedicated and appointed him "a prophet to the nations" (Jer 1,5). Furthermore, this passage gives us a deep insight into why Jesus, in our recitation from St. Luke’s Gospel, says, "no prophet is accepted in his own native place" (Lk 4,24). The reason God made Jeremiah "a fortified city, a pillar of iron, a wall of brass," is because he is to speak the word of God to an errant nation, his own nation, the covenant people of Israel, and pronounce God’s "sentence against them for all their wickedness in forsaking [God]" (Jer 1,16). Jeremiah, the young prophet, is to speak divine judgment "against the whole land: against Judah’s kings and princes, against its priests and people." Because of the words he speaks, Judah’s kings, princes, priests and people "will fight against [Jeremiah] but not prevail over [him]" (Jer 1,18-19). This brings us to our Gospel for this Sunday, which is unique in the lectionary because it overlaps last Sunday’s Gospel. The setting for this pericope, this narrative is a Sabbath in the synagogue of Jesus’ native Nazareth. In last week’s Gospel, Jesus, after standing and reading a messianic passage from the scroll of the prophet of Isaiah, sits and announces both last week and today, "this passage is fulfilled in your hearing" (Lk 4,21). It is vital that we recognize just what Jesus is saying not only in order to understand the response of those present in the synagogue on that Sabbath, but more importantly to form our own response to his proclamation. Throughout Galilee, prior to returning home, Jesus was healing the sick, casting our demons, teaching at synagogue, and disputing with the religious authorities about the Law. This sets the stage for his remarkable revelation in the Nazareth synagogue, which is the astounding proclamation from his own mouth that he is the Messiah, the Anointed One, he of whom Isaiah and the other prophets foretold, and through whom the radical in-breaking of God’s kingdom was occurring before their very eyes and being proclaimed to their ears. Their response was the response of fallen humanity. 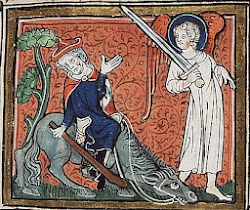 They "were filled with fury" and so they "drove him out of the town," to "the brow of the hill" in order "to hurl him down headlong" (Lk 4,28-29). What we must come to recognize is that the word of God does not grow old or become outdated. God did not just speak long ago in a faraway land. He speaks to us today. Today, as in Jeremiah’s day and in the time of Jesus, God speaks and what God says is consistent, saying the same things to us as he said to his people then through prophets, thus demonstrating that sin is still at work in the world and that "there is nothing new under the sun" (Ec 1,9). Such recognition gives us deep insight into what a prophet is. Contrary to the belief of some, being a hierarchical figure is neither a necessary nor sufficient condition for being a prophet. Of course, a prophet can be a hierarchical figure, as in the case of Archbishop Oscar Romero, who as archbishop of San Salvador agitated the political powers to the point of being shot and killed while saying Mass. More often, however, as in the case of both Jeremiah and Jesus, a prophet is an outsider and an irritant to both political and religious authorities. Just as what God says is the same, our response has a remarkable, if troublesome consistency with that of the people in the synagogue of Nazareth. After all, what political or religious leader wants to listen to a voice calling them back to God's way, away from corruption, the neglect of the poor and the misuse of their office? What comfortable, relatively well-off, patriotic, God-fearing, Christian wants to be reminded of the diseased, the starving, the abused, the mentally ill in his midst who are in desperate need of his help, not to mention the havoc his consumption habits are wreaking on our planet? In short, prophets are irritants, disrupting the artificially smooth flow of the daily life of the privileged and powerful. In our day, the powerful, and those who profit from the status quo do not want to listen to the voices of those who challenge war and aggressive international policies. Even within the Church there is a tendency among some to label the voices calling for fiscal transparency and accountability in the abuse cases as troublemakers and agitators. To give just a few examples from recent decades of prophets in our midst, speaking God’s comfort to the afflicted and, as with Jeremiah and Jesus, afflicting the comfortable, we call to mind Dr. Martin Luther King, Jr., Dorothy Day, Cesar Chavez, and Blessed Teresa of Calcutta. These past few weeks have seen both the passing of Abbé Pierre, known as the conscience of the French nation, who, amidst the ruin of World War II, founded the Emmaus movement, an international organization dedicated to assisting the poor and homeless in wealthy, Western societies, and the senseless murder of the Christian Armenian voice of conscience in Turkey, Hrant Dink. 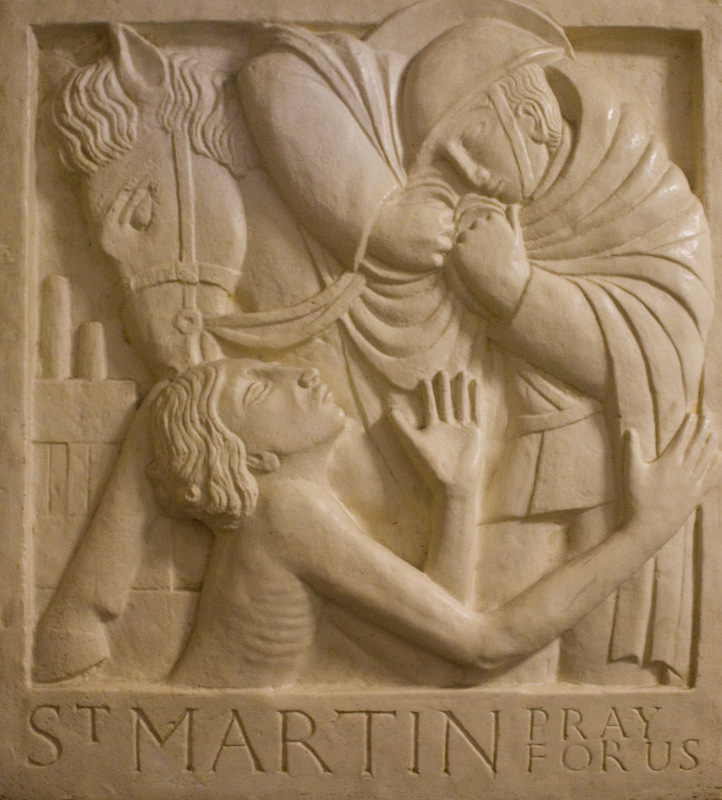 Today in our country, Sr. Helen Prejean, whose ministry of reconciliation, memorably captured in her book Dead Man Walking, and the resultant film, does much to convict the conscience of our nation, which takes such pride in calling itself Christian, about the death penalty which, according to Pope John Paul II, should be practically abolished (Evangelium Vitae, 56). If we are properly disposed we can hear God’s voice in unexpected places, such as in the wilderness of popular culture in both the music and activities of the band U2, an Irish band that was revolutionary in my youth for building bridges by having both Protestant and Catholic members and calling for an end to violence in Belfast and who now, among other things, bring much needed attention and relief to poverty and other issues on the forgotten continent of Africa. Right now, we need prophets to speak to our nation on the issue of immigration, to remind our elected representatives that, contrary to Robert Frost’s ironic poem, good walls do not make good neighbors and to remind all who would call themselves Christian that welcoming the stranger among us falls under Jesus’ commandment to love our neighbor and was an offense for which God, through the prophets, frequently chastised ancient Israel. For our neighbor, as Jesus teaches us most powerfully in the parable of the Good Samaritan, is especially the one whom I see as "the other," the person who is different from me and, hence, is one who makes me uncomfortable. As we have seen, being a prophet requires great courage. It requires great courage because prophets, as our Lord says, are not accepted in their own native places. Just as those in Nazareth that morning asked after hearing Jesus proclaim himself Israel’s Messiah, "Isn’t this the son of Joseph? ", so those to whom prophets speak often fail to hear in their voices the very voice of God and echoes of the words of Christ because, as St. Paul writes, God uses, "earthen vessels to show that the transcendent power belongs to God and not to us" (2 Cor 4,7). Not being accepted, beginning with the prophets of old, extending through the Lord himself, and continuing in our day, often means laying down one’s life, as in the cases of Archbishop Romero, Dr. King, Hrant Dink, and Bobby Kennedy, who, after the assassination of his brother, took a risk and, moving outside the bubble of his own privileged life, had his eyes opened and his conscience convicted by what he saw and experienced and concluded that as a country we not only could, but had to be a better, more just society, which is the only way to realize a more perfect union. So, we must see that what makes the other more than merely the other is seeing in him/her not only the imago dei- the divine image- but seeing Christ. In both baptism and confirmation we are anointed with sacred chrism as priests, prophets, and royalty. This calls us to be alter Christus- other Christs. My dear sisters and brothers, as we celebrate this Eucharist, let us ask how and where God is calling us, individually and as a community, to stand up and tell all He commands us (Jer 1,17)- for in the face of sin and injustice prophets remain neither passive nor silent! Contrary to what Martin Hiedegger thought, which was that Philosophy got all messed up when Greek thought was filtered through the Latin language, Latin is lovely, concise, and descriptive, and certainly worthy of living on. This is an update on the status of the mostly feared, but in some, very small and cramped quarters eagerly anticipated, Universal Indult Pope Benedict XVI is said to have been considering, which would allow the Latin Mass from the 1962 missal to be used by priests at their own discretion, without having to get the permission of their bishop to do so. The update comes from no less a source than the Holy Father's resident Latinist, the Carmelite, Fr. Reginald Foster in an interview with the U.K.'s Telegraph entitled Pope's Latinist pronounces death of a language. It is important to note that, despite his concern for the fate of Latin in the Church, Fr. Foster does not favor a return to the Latin Mass for many of the same reasons I have mentioned in previous posts. As you will see, however, Fr. Foster, as is his want, is a bit more plain spoken about his objections than I am. Fr. Foster sets forth the concern that we should all have about Latin as Roman Catholics, which concern should cause us to take measures to maintain its currency. Put simply, Latin should not become extinct. It should remain the universal language of the Church and still comprise parts of our liturgy, the Credo, Sanctus, Agnus Dei, etc. Clergy, priests and deacons, should be educated in Latin, as should liturgists, musicians, cantors and choir members. The normative texts of the Church, including the Sacramentary, all the Rites, the Code of Canon Law, Papal Encyclicals, etc. should remain in Latin. However, the Church's worship has to allow for the full, active, and conscious participation of the faithful called for by the Fathers of the Second Vatican Council in Sacrosanctum Concilium, which means the vernacular. As to rest, I'll let Fr. Foster speak for himself. Fr. Foster "said reports that Pope Benedict will reintroduce the Tridentine Mass, which dates from 1570 and is largely conducted in Latin, were wrong – not least because of the Pope's desire to avoid more controversies. A speech last year offended Muslims and more recently he gave initial support to a Polish archbishop who was eventually forced to resign, after admitting that he had collaborated with the communist-era secret police. 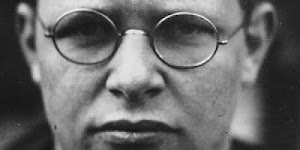 "'He is not going to do it,' Fr Foster said. 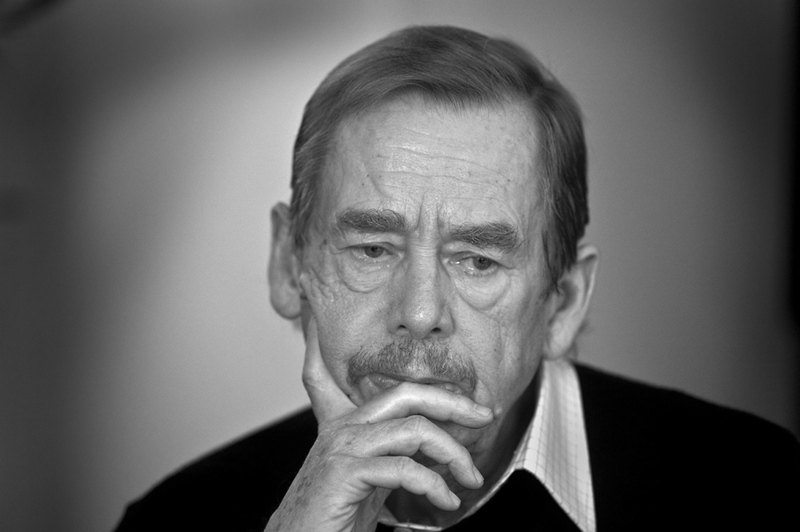 'He had trouble with Regensberg, and then trouble in Warsaw, and if he does this, all hell will break loose.' In any case, he added: 'It is a useless mass and the whole mentality is stupid. The idea of it is that things were better in the old days. It makes the Vatican look medieval.'". One of the main thrusts of my own teaching is that theology is practical, useful, and even necessary for the Christian life. My own ad hoc and largely self-directed theological education, taking its cue from my studies in Continental Philosophy, finds root in the thought of two European priests, Hans Urs von Balthasar and Msgr. Luigi Giussani and, hence, in the the Communio and Communion and Liberation schools. Both of these movements are about applying faith to life through the medium of theology. Thus, it is through them that, in the mid-nineties, I began reading the works of a leading scholar affiliated with both of these schools, one Joseph Ratzinger. One of my dearest desires is to form a CL School of Community. In the current issue of Commonweal there is an excellent article on theologian August Adam and his influence on Joseph Ratzinger, now Pope Benedict XVI by Church historian, Ulrich Lehner. One gets an idea of the primal influence of Adam (brother of Karl Adam) on the Holy Father when, as noted by Lehner in the article, a few years ago, then-Cardinal Ratzinger said: "[Adam's] book The Primacy of Love was a key reading of my youth". In no way is the influence made more manifest than in Pope Benedict's first encyclical, Deus Caritas Est. The particular passage of the encyclical that reveals the affect of one key concept of Adam's is number 18, in which we read "If I have no contact whatsoever with God in my life, then I cannot see in the other anything more than the other, and I am incapable of seeing in him the image of God. But if in my life I fail completely to heed others, solely out of a desire to be 'devout' and to perform my 'religious duties', then my relationship with God will also grow arid. It becomes merely 'proper', but loveless." "His clothes are proper from the Roman collar down to his shoes - everything exactly according to the directives . . . 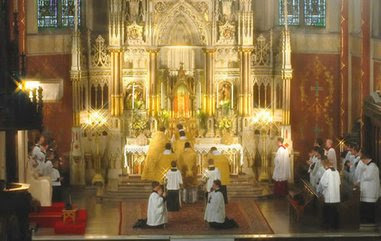 He holds the church in proper order, Mass always starts on time, the homilies are well prepared. He promptly answers and acts if his sheep come to him, but their hearts are never set on fire by him. Everything he does has something impersonal about it, like at the post office, or at the bank. He is 'proper' in everything he does . . . but he lacks a mysterious something, a grain of salt and a speck of ambergris". Before addressing what is lacking, let me first address the word ambergris. According Merriam-Webster, ambergris is "a waxy substance found floating in or on the shores of tropical waters, believed to originate in the intestines of the sperm whale, and used in perfumery". Okay, now to that "mysterious something" - it is nothing less than "selfless love," or, agapé. With very little imagination, one can translate this to Christians in any state of life. Adam's concept of "the proper Christian", at least at first glance, seems to articulate what I was groping after last Friday in my post Kindness: An essential part of agapé. Writing of anniversaries and mercy for sinners, Cunny Pelaez pleaded guilty yesterday to the first degree felony murder of our dear brother, Deacon Aniceto Armendariz, on the third anniversary of Aniceto's ordination. 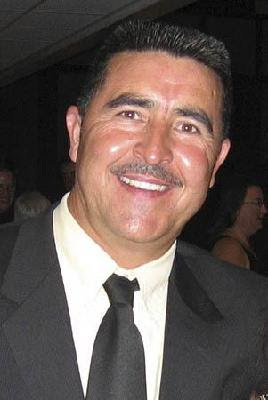 Mr. Pelaez's father, Antonio Pelaez-Vasquez, also accused of the senseless murder in September 2005, is not scheduled to go on trial until July. For more details see the Salt Lake Tribune on-line: Guilty in murder of deacon: Plea deal allows 1 suspect to avoid a capital charge. Let us pray for continuing comfort and strength for Aniceto's wife, Alma, and for their children. We must also pray for the repentance of Cunny and Antonio. I am confident that the Pelaez-Vasquez's have a heavenly intercessor praying for their repentance and salvation- none other than Aniceto himself, a man, like the apostle Nathaniel, with "no duplicity in him" (Jn 1,47). 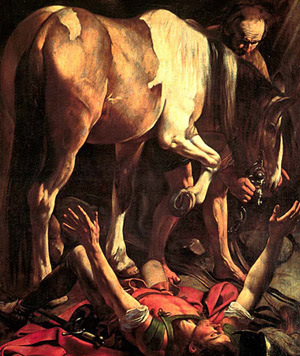 Today marks the Feast of the Conversion of St. Paul. This is a very ancient observance in the Church and it is a day in recent history on which many things have occurred. So, with no further adieu I direct you to two posts that tell you the significance of this day in recent history. I will begin locally by pointing to Gregory Glenn's post on our parish blog The People of St. Mary Magdalene and, then, for the universal Church, link you to Rocco over at Whispers. "I myself once thought that I had to do many things against the name of Jesus the Nazorean, and I did so in Jerusalem. I imprisoned many of the holy ones with the authorization I received from the chief priests, and when they were to be put to death I cast my vote against them. Many times, in synagogue after synagogue, I punished them in an attempt to force them to blaspheme; I was so enraged against them that I pursued them even to foreign cities. On one such occasion I was traveling to Damascus with the authorization and commission of the chief priests. At midday, along the way, O king, I saw a light from the sky, brighter than the sun, shining around me and my traveling companions. We all fell to the ground and I heard a voice saying to me in Hebrew, 'Saul, Saul, why are you persecuting me? It is hard for you to kick against the goad.' And I said, 'Who are you, sir?' And the Lord replied, 'I am Jesus whom you are persecuting. Get up now, and stand on your feet. I have appeared to you for this purpose, to appoint you as a servant and witness of what you have seen (of me) and what you will be shown. I shall deliver you from this people and from the Gentiles to whom I send you, to open their eyes that they may turn from darkness to light and from the power of Satan to God, so that they may obtain forgiveness of sins and an inheritance among those who have been consecrated by faith in me.' And so, King Agrippa, I was not disobedient to the heavenly vision. On the contrary, first to those in Damascus and in Jerusalem and throughout the whole country of Judea, and then to the Gentiles, I preached the need to repent and turn to God, and to do works giving evidence of repentance." Writing about doing "works giving evidence of repentance", with sundown, which occurs at 5:36 pm this evening, comes Friday, our day of abstinence and penance. So, like the wise virgins, think about how you will observe tomorrow while it is still today. Will you abstain the meat of flesh animals (i.e., warm-blooded creatures), which is the traditional way of observing Friday? Or, will you fast, abstain from sweets and/or alcohol? For married couples, by mutual consent, will you abstain from sexual relations? Will you give alms to a charity, perform works of charity, etc.? As I have mentioned in the past, it is entirely up to you whether to observe Friday at all and, if you decide to observe Friday, it is entirely up to you how. 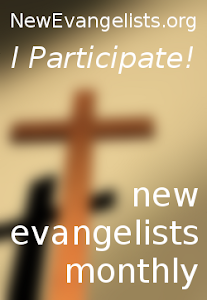 I will state that it seems a shame to pass up any opportunity to conform ourselves to Christ. 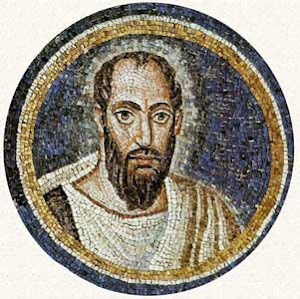 Sancte Paulus ora pro nobis. Have a happy Feast day. In sticking with the theme of Sacraments, it is notable today that the "sacrament of Holy Orders is conferred, in each of its three degrees," [bishop, priest, deacon] "by means of the imposition of hands on the head of the ordinand by the Bishop who pronounces the solemn prayer of consecration. With this prayer he asks God on behalf of the ordinand for the special outpouring of the Holy Spirit and for the gifts of the Spirit proper to the ministry to which he is being ordained" (Compendium of the Cathechism of the Catholic Church , 331). 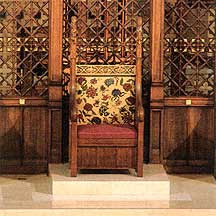 This is notable today because it was three years ago on this day, 24 January 2004, along with 24 other men, I knelt before His Excellency, the Most Reverend George Hugh Niederauer, then-Bishop of the Diocese of Salt Lake City, before the cathedra you see pictured above, which is in The Cathedral of the Madeleine, pledged my respect and obediance to him and to his successors, and received by the laying on of his hands, the Sacrament of Holy Orders to the degree of deacon, thus entering the clerical state. Two of my brothers who were ordained that day, Aniceto Armendariz and Gerald Shea, have gone home to be with the Lord. A third, Scott Chisholm, a retired professor and author, most notably of Following the Wrong God Home: Footloose in an American Dream, suffered a debilitating stroke a little over two years ago, the week after our annual diocesan deacon's retreat. So, it has been quite a journey so far, a lot like that of any family with its ups and downs, its tears and joy. Along with the Sacrament of Matrimony, Holy Orders is a Sacrament in the service of communio. According to the Compendium of the Catechism of the Catholic Church, these two sacraments "confer a special grace for a particular mission in the Church to serve and build up the People of God. These sacraments contribute in a special way to ecclesial communion and to the salvation of others" (Comp. 321). "Holy Orders," according to the Compendium, "designates an ecclesial body into which one enters by means of a special consecration (ordination). Through a special gift of the Holy Spirit, this sacrament enables the ordained to exercise a sacred power in the name and with the authority of Christ for the service of the People of God" (Comp. 323). "The deacon, configured to Christ the servant of all, is ordained for service to the Church. He carries out this service under the authority of his proper bishop by the ministry of the Word, of divine worship, of pastoral care and of charity" (Comp, 330). Finally, the Sacrament of Holy Orders, like Baptism and Confirmation, "confers an indelible spiritual character and therefore cannot be repeated or conferred for a limited time." To give the short version of faith education, there is only one reason to be Christian: Jesus Christ. There is only one reason to be Catholic: the Sacraments. Why? Because it is through the Sacraments that Christ comes to us. The Sacraments are where Christ meets His people in space and time. It is almost impossible to exaggerate how central the Sacraments are to Christians. Therefore, especially for those adults preparing to be incorporated into Christ's mystical Body, the Church, it is critical to grasp these two crucial facts. Sara, one of our Candidates in this year's RCIA program has asked me several times recently about the relationship between faith and the Sacraments. Like all her queries, it is a good one that gets to the very heart of faith. Because her question gets to the heart of faith, any answer will fall short of the reality it seeks to express. Too often many Catholics, even those charged with teaching the faith, have what might be termed a Protestantized understanding of the Sacraments. Now to just leave it at Protestantized is to paint with a broom, as there are Protestants who are strongly sacramental and ecclesiological. Insofar as these Christians, who are Protestant because they are not in communion with Rome (Orthodox excluded), are sacramental, they are catholic (small "c" intended). Therefore, to clarify, given the ocean of Evangelical publishing and programming that constantly engulfs us, this Protestantized understanding is of an Evangelical variety, with Evangelical here understood in the vernacular sense. This Evangelical variety of Protestantism puts a premium on faith, but faith improperly understood. The misunderstanding of the nature of faith is most discernible in the tendency to conflate belief and faith. The two are not at all the same thing. While belief is certainly a part of faith, it is only a part and not even the most important one.Why? The oversimplified answer is that we choose what we believe, we think and arrive at conclusions. This also reveals the thin membrane between faith and reason. To make it even more simple, we look to Jesus who makes it clear that he chooses us, we do not chose Him, over and over again throughout the Gospels (Matt 22,14; Lk 18,7; Jn 13,18; Jn 15,19). Now, that being written, there is a sense in which faith is important to the efficacy of the Sacraments, especially as a person grows into maturity. On closer examination, this amounts to nothing more than being conscious and open to what God is already doing in and through the Sacraments. The fundamental reality being that the Sacraments are about what God does and not about what we do is borne out by the fact that we baptize infants and administer the Sacraments of Confirmation and Communion when children are 8, even confirming infants who are in danger of death. But, even at 8, children do not have a solid grasp of what it is all about. Nonetheless, the grace conferred by God in these ritual actions is at work by the power of the Holy Spirit. Grace is nothing less than God sharing divine life with us, the very life of the Blessed Trinity, which is love - agapé. To grab a more salient example, taking a cue from the Donatist heresy which raged through North Africa during the episcopacy of St. Augustine, say a man receives, validly and licitly, Holy Orders, priestly or diaconal ordination, from a bishop by the laying on of hands. Let us say that this man is ordained a priest but does not believe anything happens in this ritual action, he lacks faith that he has been ontologically changed. Is he any less a priest? No! In this case, or any case like it, he is a priest whether he believes it or not. Will his unbelief affect his ministry? Of course it will and probably not for the better. Nonetheless, his lack of faith does not invalidate the Sacraments he celebrates, that is the Masses he says, the absolution he gives, the sick he anoints, the baptisms he administers, the marriages he witnesses. Why? Because it is Christ at work through him, even the one who lacks faith. This holds true even when a priest who lacks faith administers the Sacraments to a person who has no faith. After all, was Jesus any less Israel's Messiah because many Jews did not recognize Him as such? Likewise, is He only the Messiah, Savior, and Lord of those who recognize Him in the Sacraments? One of the most humbling moments for me as deacon is when I administer the Sacrament of Baptism with the words, "I baptize you in the name of the Father, and of the Son, and of the Holy Spirit". The "I" who baptizes is not me, Scott Dodge, it is the Lord Jesus Christ who baptizes, using me an earthen and unworthy vessel. This reality is enough to make me fall on my face in awe and, with the prophet Isaiah, declare my unworthiness. The same in persona Christi understanding is at work when the priest, at the consecration says, "This is my Body . . .", "This is my blood . . .", or in confession, "I absolve you . . ."
To sum up, Sacraments are the means God uses to communicate grace to us. While having faith in what God is doing in and through the Sacraments certainly opens us up to receive what God is giving, our lack of faith does not and cannot negate or neutralize the fact that Christ, by the power of the Holy Spirit, is really and truly present in the material elements- bread and wine, water, oil, the laying on of hands, the breath of consent and absolution. Christ's presence in these elements is an objective fact, it is not just real, it is reality. "'The Vatican could, in future, field a team that plays at the top level, with Roma, Inter Milan, Genoa and Sampdoria,' said Cardinal Tarcisio Bertone, the Vatican's Secretary of State, the equivalent of its prime minister. "He said: 'We can recruit lads from the seminaries. I remember that in the World Cup of 1990 there were 42 players among the teams who made it to the finals who came from Salesian training centres all over the world. "'If we just take the Brazilian students from our Pontifical universities we could have a magnificent squad.'" Since the U.S. still seems years away from fielding a competitive World Cup team and MSL, quite frankly, is not all that exciting, how cool would it be to have a Vatican team to root for in a major European league? 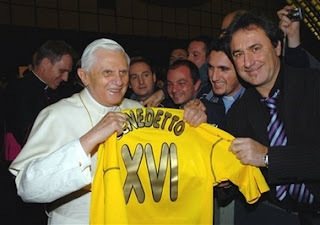 I suppose Cardinal Bertone would have shift his own allegiance from Juventus to the Vatican team. I vote for the Papal Legates as a club name! In all honesty, I think the good Cardinal was half joking and half day-dreaming. In other words, don't look for the Papal Legates to take the field anytime soon. I am poaching like a madman this morning, but why duplicate effort, especially among colleagues in the same parish? Today, we mark the 34th anniversary of the infamous Supreme Court decision in Roe vs. Wade, which has wreaked havoc in our country far beyond providing the legal basis for the unlimited abortion license, with its creation, out of thin air, of a Constitutional right to privacy. Anyway, check out Gregory Glenn's post as we mark today, Monday a Day of Prayer and Penance, over at our The People of St. Mary Magdalene blog. Please pray today for an end to the gross violations of human dignity that occur everyday in our great country. Find ways to get involved, to assist women in crisis pregnancies, contribute to Pregnancy Resource centers, make your parish a place that women in these dire situations can turn to for help, advice, compassion, and understanding. Write your Senators and Representatives to express your opposition to the bill that passed the House of Representatives last week and to the one, sponsored by Orrin Hatch, due in the Senate soon. Also, take the opportunity to learn about life issues, which, as Mr. Glenn accurately points out, are quite complex. 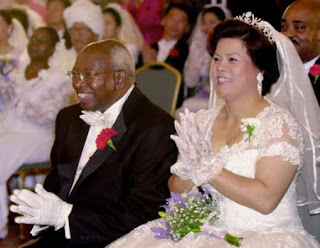 Some of you may be familiar with case of the renegade prelate, Archbishop Emmanuel Milingo, a deposed Zambian archbishop, who several years ago got married in a mass "Moonie" wedding to a Korean woman. 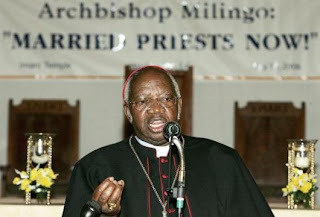 After this silly and embarassing event, Pope John Paul II called on Milingo to repent and to abandon his illicit and invalid marriage, which is no marriage at all. At that time Milingo complied. So, you can see the interest in the story apart from the alliterative quality of the title. The Canonical impediment that prevents Milingo and all in Holy Orders from licitly or validly entering into the holy state of matrimony is called a diriment impediment, which, according to Canon 1073, is an "impediment [that] renders a person unqualified to contract marriage validly". Following Canon 1078 §1, in most cases the local bishop "can dispense his own subjects residing anywhere and all actually present in his own territory from all impediments of ecclesiastical law except those whose dispensation is reserved to the Apostolic See". One diriment impediment reserved to the Holy See (i.e., the Pope himself must give the dispensation), according to Canon 1078 §2, 1/is "the impediment arising from sacred orders or from a public perpetual vow of chastity in a religious institute of pontifical right." This certainly holds true in the case of a bishop, who has the responsibility of maintaining communion with the Bishop of Rome. As Canon 375 §1 states "Bishops, who by divine institution succeed to the place of the Apostles through the Holy Spirit who has been given to them, are constituted pastors in the Church, so that they are teachers of doctrine, priests of sacred worship, and ministers of governance." 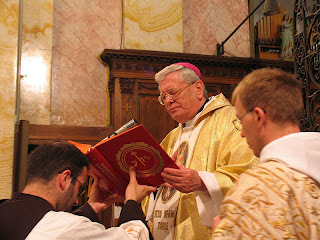 §2 of this same Canon gets to the point of what I am getting at: "Through episcopal consecration itself, bishops receive with the function of sanctifying also the functions of teaching and governing; by their nature, however, these can only be exercised in hierarchical communion with the head and members of the college." This is true not only of bishops, but priests and deacons as well. If a deacon is to be married, he must be married prior to receiving sacred orders. Once in sacred orders, a deacon cannot remarry, even if widowed, without receiving a dispensation of the canonical diriment impediment outlined above from the Pope himself. Of course, in the case of bishops and priests of the Roman Rite, such a dispensation would never be granted, unless they had previously gone through the canonical process of being "laicized", in which case the permission is already granted. Laicization means one is no longer in the clerical state and, hence, does not enjoy episcopal or priestly faculties. However, like Baptism and Confirmation, the Sacrament of Holy Orders, to use a traditional metaphor, leaves an indelible mark. Hence, ontologically, one remains a priest, a deacon, though unable to function as one. After abandoning his "wife" and returning to Rome, last year he left Rome once again and took up with his "wife". Later, in Baltimore, he ordained four priests who abandoned their priestly ministry to marry and had formed schismatic congregations, to the episcopate without papal mandate and formed what he calls a "Prelature" named, appropriately enough, "Married Priests Now"; in true Milingo fashion, not a lot of nuance there! Anyway, Rocco reports this morning on An Exchange of Letters. The letter in question, dated 27 November 2006, was ordered written by the Holy Father himself in response to two letters from Milingo, it was written by, but undoubtedly personally approved by the Pontiff, the Prefect of the Congregation for Bishops, Giovanni Battista Cardinal Re to Milingo. The letter shows how important communio is for all Christians, but especially for someone who is a bishop. The gravitas comes in the passage to the renegade archbishop, "you are aware that such actions will render you responsible before God loaded with such a grave sin, which will cut you away from the Church, and of course excommunication". It continues, "One day each one of us will have to render account before God for such actions which will be judged according to the truth." Besides which . . . 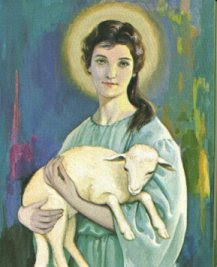 Tomorrow (this evening in liturigical terms) marks the Feast of St. Agnes. I wish I had more juice to write more on this lovely holy woman- girl really. It's just that after a busy week, a day spent rooting for the Cathedral Crusaders at b-ball games, and stripping wallpaper from a long overdue home project, I am spent. Like Santa Lucia, she is an awesome saint, whose feast this year is trumpted by a Sunday- this is certainly more than alright, without what we celebrate on Sunday sainthood would be non-existent. So, over to Rocco at Whispers for more on this great feast with extraordinary ecclesial implications. to put the worldly power to shame. be loyal to the faith she professed. one God. for ever and ever. "Every time you do something nice for someone you get closer to God". Ghandi, Merton, Nouwen, Br. Lawrence, Richard Foster? No, a six year-old daughter of a certain deacon who resides in Northern Utah as she shovelled our sidewalk and then that of our neighbors. Like all of my parent readers who take seriously their responsibility as the primary catechists of their children, I often wonder if any of what my wife and I teach our children either by word or example takes. In the words of my Arabic Muslim friends Insha'Allah, if God wills it. I thank God for sending me one of those consolations about which I wrote the other day. It is nice to see a ray of light, especially on a snowy day. My last post dealt with the necessity for us, as Christ's disciples, not put ourselves first, but to live sacrificially for others. It is easy, as re-reading yesterday's post shows me clearly, to remain very abstract about what this means for our lives. 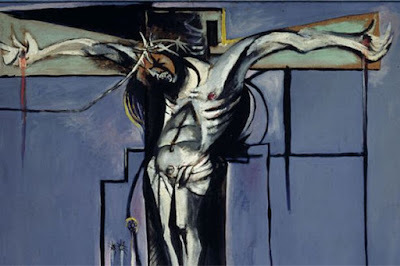 This morning, as I was composing a post for our parish blog, a very strong and concrete connection was cemented in my mind between believing that we should live for others and specific actions we can take that make this belief, this conviction, a reality. At the beginning of our Centenary kick-off at The Cathedral of the Madeleine we are undertaking a three-year program which so far includes a Stewardship campaign and a pastoral plan with the theme Furthering Our Legacy of Faith, Hope and Love. Both of these undertakings call upon us, even if you're not a Cathedral parishioner, to live selflessly by giving of our time, our talents, and our treasure to serving God, to the realization of His Kingdom. In short, our baptismal vocation as God's priestly people calls upon us to live sacrificially; putting others before ourselves. Dear friends it is Friday once again. This day finds us firmly in Ordinary Time, moving rapidly toward Lent. It is with this in mind that I turn to thoughts of what we have to abstain, fast, pray, and do penance about, both individually and corporately. Earlier this week I uploaded and then deleted a post on kindness and its role in Christian life. I know my takes on these matters are kind of abstract and are certainly theological. I make no apologies for this, as I am firmly convinced that, just as how we pray forms and informs what we believe (lex orandi, lex credendi), what we believe forms and informs how we act. In other words, orthopraxis (correct practice) flows from orthodoxy (correct belief). I also know that the connection is not always obvious and that integrating what we believe with what we do in our everyday life is the challenge for all Christians, that is what it means to have integrity, or, to use a good old fashioned term, to be perfect, for which we need God's gracious help. What makes the connection discernible or even perceivable is love- agape. Agape is the kind of love we are to have one for another, it is the subject for our Holy Father’s encyclical Deus Caritas Est. In St. John’s Gospel, in his Last Supper discourse, Jesus tells the twelve: "As I have loved you, so you also should love one another. This is how all will know that you are my disciples, if you have love for one another" (Jn 13, 34b-35). In this passage the word love, in the original Greek, is a form of the word agape. In my deleted post I wrote that as regards the relationship between kindness and agape, we must resist two temptations. The first temptation that needs to be resisted is conflating agape and kindness, thus mistaking a part for the whole. We must also resist reacting to the first tendency, which is to dismiss kindness from comprising any part of agape. To be kind means to be of a sympathetic or helpful nature, to be forbearing, and to be gentle. Hence, kindness is the quality or state being kind. As with any polarizing tendency, sticking with the spectrum metaphor, the truth lies somewhere between the two poles. Put simply, kindness is only one aspect, a very crucial aspect, of agape, which is multifaceted. This is worth exploring because far too often at Church, sometimes even more than in our other activities; we are petty, unkind, dismissive, and neglectful of one another. Like the ancient Israelites, we sometimes get too focused on correct liturgy and ritual to the neglect of the poor and needy, not to mention each other. If we are not a community of kindness, along with being a community of justice, peace, honesty, etc., everything we do is a lie, a charade, mere lip service. One cause for the paucity of kindness is that, even as Christians, we tend to have as the focus of our faith ourselves, our own fulfillment, and our own happiness. We think, pray, and worry about what we, individually, are getting out of being Christian, out of going to Mass, out of whatever activities we are engaged in at Church. Nothing could be more anti-thetical to following Christ than being so self-focused. We are taught by the Master himself that "Whoever finds his life will lose it, and whoever loses his life for my sake will find it" (Matt 10,39). How we discuss altruism is indicative of our tendency to focus on ourselves. "It feels so good to help people," we often hear people say after dishing up a few plates of food at the soup kitchen. Now, God bless such people for doing something good, whatever their motivation. However, what about helping, assisting, loving when it doesn’t feel good, or when we don’t want to? Do we get a free pass if we are quite convinced we are going to get nothing out of it? If we serve others when we don't feel like it, is it okay to be uppity, condescending, or unkind? I hope these are all rhetorical questions, the answer to all being a resounding No! Is this to write that we should never get anything, personally, from the practice of our faith? No! It is to write that it is not always the case that we do, or should. If the only way we listen to God's voice is in the warm fuzzy, we will miss much of what God is telling us, both individually and corporately. If we only attune ourselves to the warm fuzzy, we will miss the most important things God is trying to tell us. However, we can be confident that God, our loving Father, will give us what we need. Such consolations do not come by us seeking them. Often what we receive is what the widow of Zarephath received by agreeing to feed the prophet Elijah during a period of drought and famine, just enough for that day’s need (1 Kgs 17). Of course, this is echoed in the Prayer of the Kingdom, taught us by Christ, "give us this day our daily bread" (Matt 6, 9-13). For our part, we must "seek first the kingdom (of God) and his righteousness," and God will provide what we need (Matt 6,33). This Friday I am doing penance for not bearing wrongs, or perceived wrongs, patiently. For bearing grudges and even nursing grudges. I am also mindful of those times when I am not as kind, or giving, or attentive as I should be to other people. I am praying for better awareness of my weaknesses and areas of immaturity. For what it is worth, that is what is on my mind this Friday. "During Nancy Pelosi's speaker celebrations this month, as the Pelosi clan drove through the streets of Washington and Baltimore together, some protesters held up signs that read, 'Pelosi Preys on Children' -- a reference to the speaker's pro-choice stand, which contradicts church doctrine. 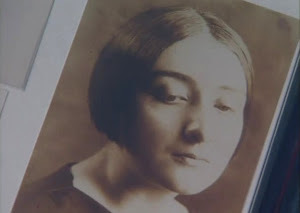 "My mother, throughout her entire life, has been faithful to the church, even though the church has not been that faithful to her because of her politics. And I think that takes a lot of perseverance," she says. "And still, people protest her right to go to her own church." The above words are the words of Alexandra Pelosi, daughter of House Speaker Nancy Pelosi, a 36 year-old documentary film-maker, who has recently returned to the practice of the faith. Her return, according to the San Francisco Chronicle, was driven by two events. First and foremost the birth her son and, secondly, was the making of her documentary on the Evangelical movement. All this is contained in an San Francisco Chronicle article, Behind the red curtain Documentary filmmaker Alexandra Pelosi, daughter of the speaker, leaves the blue states for some cultural learnings of her own, which was brought to my attention by Rocco over at Whispers. This is not an endorsement of or apologetic for some of Speaker Pelosi's more controversial political positions, just an attempt to offer some much-needed perspective from a Christian POV and to show how destructive and un-Christian ad hominem attacks are. 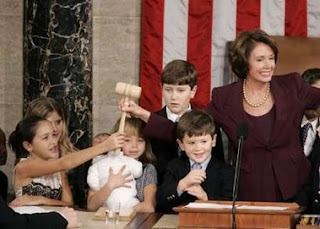 As to Speaker Pelosi's positions on issues of life, which trouble me, it must be pointed out that she is the mother of 5 children, four daughters and a son. As a father of four, who can be overwhelmed by a single one year-old, and who is eveyday amazed at the grace under pressure my lovely wife shows (a great Rush album, btw), this reality, this lived experience, says a lot to me. I also have to write that ad hominem attacks on President Bush have no place in civil discourse, as vehemently as people may disagree with his positions, policies and actions. Before discussing her newfound appreciation of Church and religion, along with her intent to have her son baptized, Alexandra didn't "like to say she's a 'lapsed' Catholic. Because when she does, her mom, recently appointed House Speaker Nancy Pelosi, tends to take it as a 'failure that she couldn't keep me in the church.' That position looks especially bad lately, after the elder Pelosi stressed her devout Catholicism during swearing-in ceremonies this month. "So despite 12 years of Catholic education in San Francisco and four more at a Jesuit university, Alexandra, a 36-year-old documentary filmmaker, prefers to say that Catholicism 'didn't stick. I always try to tell my mother that I believe in God, but I don't believe in church. But that offends her. Parents take it personally when you reject something they gave you'." Please read the UN Assistance Mission for Iraq: Human Rights report 1 November-31 December 2006. Then read the Iraq Study Group Report, then look at President Bush's speech on Iraq last week. Follow the links I've provided, it's all there at your finger tips. Then, after all that, think. What would you do? Would you strike out on your own, following the advice of those who have led you to the brink of disaster, or would you listen to a fresh perspective? Would you talk to Iran and Syria with no pre-conditions, or continue to ignore the two countries who, odious as they may be in many regards, can help? Now, I don't know how many readers have first-hand experience of violent death, but if you watched last night's second two hour part of the two part season premier of 24, when Jack can't breathe, gets disoriented, and starts yacking all over the grass after killing a comrade-in-arms who is trying to get a vengeance kill on a terrorist responsible for the deaths of men in his U.S. Army SpecOps company over decade before, I believe comes pretty close. It doesn't seem to me that in face of multiple deaths and casualties there is a lot of chest-thumping bravado. Rather, I envision a lot of white faces, blank stares, and, yes, puking. As Andy Rooney of 60 Minutes, who served as a grunt in WWII once remembered, after 60+ years, what remains with him about his experiences of combat is the smell. Smoke canisters, fuel, gun-powder, other incendiaries, burning flesh and hair, not to mention the noise of engines, helos, screaming, temporarily insane, freaking-out people, bombs not on target, the pork slices in barbecue sauce with way too many preservatives you ate a few hours ago, etc. 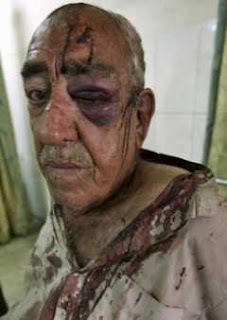 Just think about it, in 2006 such incidents occurred throughout Iraq many times per day, yielding, on average, over 94 deaths every, single day. It is a slaughter of innocents by ruthless men, terrorists and rogue militias, the latter aided and abetted by Nouri al-Maliki, the half-hearted anti-hero and his ilk. Yet, our answer is to send more U.S. troops into the meat grinder of Baghdad on the promise of ignoble and dishonorable men. God have mercy!! What a hornet's we've managed to stir up! If we factor in the wounded, many of whom were wounded seriously, the number more than doubles to 195 per day. At the core of leadership is not setting your people up to fail. This seems a simple enough way to analyze a situation. 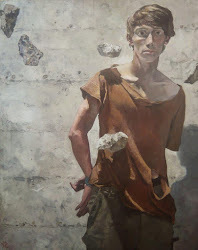 Before I had even heard of Just War theory, before I ever entered a formal Philosophy classroom, I knew a war can only be just if it is fought with a reasonable chance of success. Deaths and injury incurred in a hopeless cause are not morally justifiable. I can state without equivocation or evasion that without the whole-hearted cooperation of al-Maliki's government both militarily (i.e., taking down militias, like al-Sadr's Mehdi Army) and politically (i.e., embarking on program of national reconciliation- which means an end to executions, among other things), we cannot succeed. SecState Rice's diplomatic efforts smack of too much, too late, though I wish her all the best and hope she can secure the steadfast support of Arab governments. Meanwhile, in the Horn of Africa, Somalia to be exact- you remember Somalia, right? Black Hawk down, etc. ?- Al Qaida has managed to regroup and retrain. We are stretched so thin that we're relying on that highly professionalized military force, the Ethiopian Army (there goes sarcasm again), and supporting them with a single AC-130 gunship. Yeah! So, please say a prayer tonight for all our men and women in Iraq, especially for those who don't wear a regular uniform and who do all the dirty work, whose lives are totally devoted to this great country of ours, who are too often away from their families and, as a result, have a high divorce rate and are deprived of their families. They are the ones who nightly run into the heart of chaos, seeking to bring order, who fight this many-headed hydra, who will never get the recognition they deserve outside of their own community- God knows who for whom you are praying. Also, pray for the people of Iraq, for their safety and security, which these brave men seek to bring about. In an earlier post, Stewardship, not devastation, I mentioned the increasing stress that human activity is putting on the Earth's environment and how, as Christians, we are stewards of God's creation. Protection of the environment is also something the Holy Father has stated on several occasions is part of the authentic proclamation of the Church. I also mentioned this crucial issue in my homily for the Solemnity of Mary, Mother God, which is also the World Day of Peace. 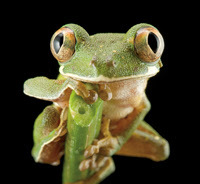 Thanks to Conservation International (CI), we can translate this big theme into concrete action. CI's 10 New Year's resolutions strike at the heart of, what America magazine calls, "consumerist society's most ingrained habits". Here are five of the ten things we can do that will help protect the environment, in no particular order. - Buy locally produced meats and produce. CI helpfully tells you how: "Just type in your zip code on Local Harvest's website to see a list of farms and farmers’ markets close to home, as well as nearby restaurants committed to supporting their neighbors. Buying locally produced food cuts out the middlemen and the vast amounts of energy required to get your products onto store shelves. Most produce in U.S. supermarkets travels an average 1,500 miles before it is sold!" For the remaining five, follow the link to CI above. This weekend my two older children finally convinced me to watch Nacho Libre, which means, apropos of Ignacio's, played by Jack Black, physique, "free nacho". I was not resistant to watching the movie for any reason other than I am usually too busy these days to watch films, which has always been a favorite past-time of mine. One of the things my spiritual director does when we are planning a retreat, is build in a couple of movies. As a visiting French priest teaching a class on Theology and Film replied to the complaint of a seminarian about wasting time on such a class, "My dear son, in France nobody goes to Church, but everyone goes to the cinema". Anyway, I loved Nacho Libre, not least because this wonderfully silly film is loosely based on the true story of a real life Mexican priest, Fr. Sergio Gutierrez Benitez, who wrestled professionally for over twenty years under the name Fray Tormenta, en Ingles, Friar Storm. Like Nacho Libre, he wrestled in order to support the orphanage he directed. Another aspect of the movie, apart from the film itself, that attracts me is that it is co-written and directed by Jared Hess, who is a fellow native of Utah, an LDS film-maker who attended BYU and who gained fame with his film Napoleon Dynamite, along with his wife, Jerusha. My favorite scene without a doubt occurs after Nacho and his side-kick, Esqueleto, en Ingles, the Skeleton, begin to earn some money wrestling and Nacho emerges from the W.C. looking relaxed and relieved and says, in his cheesy accent, "I'm worried about your salvation n' stuff". He then asks Esqueleto why he was never baptized. To which he replies. "Because I never got around to it, Okay!?" Then, not so subtly, but without catching the attention of Stephen (i.e., Esqueleto), while pretending to wash his hands, fills a bowl with water. Shortly afterwards, he pushes his companion's head into the water, thus baptizing him. More from the Archives soon to be published! I received some very good news yesterday from a parishoner, our lector for the Mass, who also happens to be the professor whose lecture room was the first one I walked into to begin my studies in Philosophy and History at the U of U, Dr. W. Lindsay Adams. In a case that a Jungian (which I, most decidedly, am not), in light of my post last week, In the Archives, would not hesitate to describe as synchronicity (a Police album I still adore- it came out when I was in high school), he informed me that the University of Utah Press is going to publish a newly updated edition of Salt of the Earth: The History of the Catholic Diocese of Salt Lake City 1776-1987, a comprehensive history of the Catholic Church in Utah. 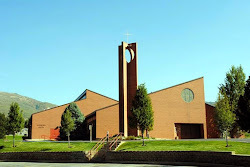 The original book, authored by Bernice Maher Mooney, was self-published by the Diocese of Salt Lake City in 1987, as was the 2003 addendum, co-authored by Maher Mooney and Msgr. 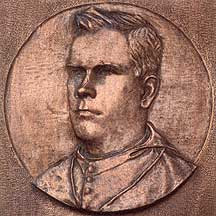 J. Terrence Fitzgerald, currently the Administrator of our Diocese, entitled Catholic Utah At The Turn of the Century, which updates the first volume through 2002. If I understood Dr. Adams correctly, the new edition will include both previously published works as well as new material taking us up to at least the end of 2006. In charge of the publication? Dr. Gary Topping! I find this very exciting. Seizing the opportunity, I suggested to Dr. Adams that it would be wonderful if the U of U Press would publish a new edition of Bernice's lovely book The Story of the Cathedral of the Madeleine, with the 1993 restoration completely documented to include new photographs, along with the classic older ones from the first edition. "The State of Utah is not generally considered Catholic country. Some four to five percent of the nearly 1.7 million people living in the state are Catholic. Yet Catholicism is indigeneous to Utah. Franciscan missionaries Francisco Atanasio Dominguez and Silvestre Velez de Escalante were the first non-Native Americans to penetrate the area within Utah's present borders. The cartographer who journeyed into Utah with them in 1776 drew the first maps ever made of what is now known as the Four Corners Region adjoining the states of Utah, Colorado, Arizona and New Mexico"
What kind of bishop is a Benedict XVI bishop? Last Tuesday in a post entitled One is Some-Counting with the S.L. Trib I was very critical of an article that ran in the Tribune trying to demonstrate that the appointment of Bishop Wester was a cause of dismay for some Latino Catholics here in the Beehive State, when even the logic of the article itself led one to a different conclusion. In the same post I lauded the front page article by Peggy Fletcher Stack, which was quite good given the short period of time she had to put it together. Peggy wrote another fine article for yesterday's Sunday Trib using the Holy Father's appointment of Bishop Wester as a kind of case study in seeking to determine what a Benedict XVI bishop looks like, entitled Is the pope signaling a new age of openness? 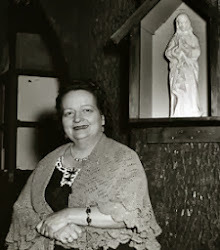 I have to say she chose several outstanding sources: Monsignor M. Francis Mannion, the priest who took a big chance on hiring me some eleven and a half years ago to fill the very big shoes of Deacon Owen Cummings, Rocco Palmo, the Philadelphia-based Vaticanisti, who, in addition to being the U.S. correspondent for the U.K. Catholic weekly newspaper, The Tablet, writes the blog Whispers in the Loggia. Similarly, Rocco was big inspiration for me deciding to start this little local blog and, later, in collaboration with Gregory Glenn The People of St. Mary Magdalene. She also spoke with David Gibson, author of The Rule of Benedict: Pope Benedict XVI and His Battle With the Modern World. Here a minor correction is in order. In her article, she incorrectly has the subtitle of Gibson's book, "Pope Benedict XVI and His Battle with the Modern Mind." She also received input for the article from Fr. Tom Reese, former editor of the Jesuit weekly magazine America, another astute observer of the U.S. and International Church. Anyway, enough attributions and accolades. I would encourage you to read Peggy's article because she does a good job of discussing the shifting trends in the Roman Catholic Church in the United States, without pushing her conclusions too far. One trend, especially with Cardinal Levada's elevation to Prefect of the Congregation for the Doctrine of the Faith, the job held by the Pope himself prior to ascending to the Chair of St. Peter, is that the Church in the Western in U.S. is in the ascendancy. This no mere political power game, it is just the reality that the Church in the West is growing rapidly, mirroring the shifting demographics of the nation. Likewise, many East Coast dioceses are contracting and having to consolidate. She also gives a quick-look at what the coming year holds in terms of the U.S. hierarchy. One aspect that the article could have dealt with a bit more is the role of the Papal Nunico in the selection process for bishops in any country, but the U.S. in particular. Rocco would have been a great source for this crucial part of the overall story. Presently, the Pope's representative to the U.S. is Archbishop Pietro Sambi. I cannot tell you how fortunate we are to have such a conscientious nuncio. He takes his job of vetting bishops seriously, just as the Holy Father, as is pointed out the article, puts a great deal of time into reviewing candidates for vacant sees. Given his two previous postings, as nuncio to Indonesia, the most populous Islamic country in the world, where he was held in very high regard, and Israel/Palestine, his U.S. posting must seem comparatively easy. One can only speculate that the reason there are several dioceses vacant after a great deal of time (i.e., Lake Charles, Louisiana, Youngstown, Ohio, Birmingham, Alabama) is Sambi's dutiful job in carefully vetting would be candidates before submitting a terna, or a list with three names- three finalists- to the Congregatio pro Episcopis, in Rome, where they are further studied before being forwarded to the Holy Father for a final decision. Suffice it to say, with Archbishop Sambi on the job, we can be confident that something like the strange case of Archbishop Wielgus, especially in light of what has happened in our country over the past five years, is unlikely to occur. As can always be expected, Msgr. Mannion gives a level-headed dose of reality when the temptation of trend spotting gets too carried away: "'There doesn't strike me as a Benedict-type bishop. The church is too large for any such thing to exist.' Besides, he says, choosing men for their ideological leanings doesn't work in the long run. Men often change when they get into a particular diocese with its unique challenges. 'Liberals become conservatives, while conservatives become liberals,' Mannion says. 'Those with one agenda take on another agenda born of the circumstances.' In a fast-moving world and church, the task of being bishop is tough enough. 'Just keeping their heads above water," he says, "is the first thing they've got to do'". What was the Holy See Thinking? Is Friday Good for You?